Kelly joined Whitelaw Twining in 2017 as litigation counsel for our Professional Liability group. She has extensive experience defending real estate agents and lawyers in claims made against them in their professional capacity. She advocates for her clients at all levels of court in British Columbia. Additionally, Kelly acts for real estate licensees in discipline matters involving the Real Estate Council of British Columbia and several real estate boards. Earlier in her career, Kelly became very familiar with the trial process as an Assistant Crown Attorney in Ontario. 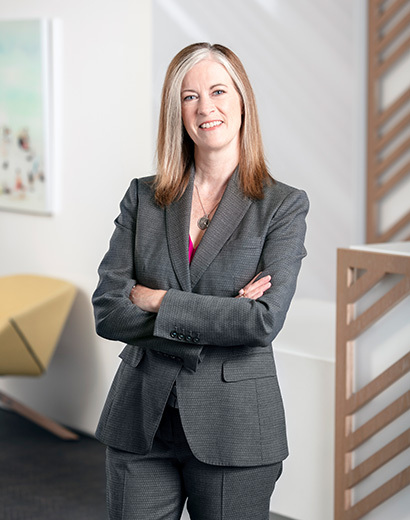 Before joining our firm, Kelly worked for nearly two decades in boutique litigation firms in Vancouver, gaining experience in general insurance law and professional liability. Her ability to quickly lead files to resolution has earned her a spot in the Best Lawyers in Canada 2018 list. When she’s not working on files, Kelly makes it a priority to mentor junior women lawyers. Outside of the office you will find Kelly with her family usually at the horse stables or off hiking or skiing in Whistler. Kelly has written a number of articles for the Real Estate Errors and Omissions Insurance Corporation Risk Report and for the British Columbia Real Estate Association.